When Watsonians won the famous Melrose Sevens in 1996, their squad included international caps such as Scott Hastings, Tom Smith, Cammy Mather and Duncan Hodge. Fast forward 22 years to the next time the Edinburgh club were picking up the silverware at The Greenyards and while the cast list may not have been so well known, it meant just as much to the group of players who had done it. 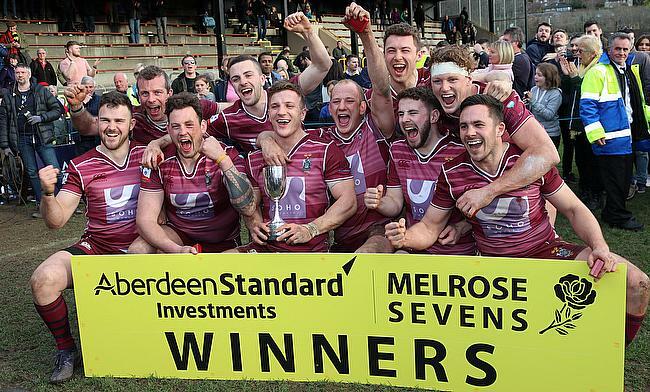 You see, for many Scottish rugby players - especially those with aspirations in the abbreviated form of the game - the Melrose Sevens is the holy grail. While usually they will be playing in XV-a-side games or other sevens tournaments in front of a few hundred spectators, well over 10,000 will fill the picturesque Borders ground for the event while BBC Scotland covers it live. As a result, players up and down the country will be getting excited ahead of this Saturday’s playing of the Melrose Sevens - and none more so than Scott McKean. Can we win the @Melrose7s again this year?!?!?!?! Get down to The Greenyards this weekend to support the team! The 26-year-old winger has been one of Watsonians star men in recent times as over the last couple of years, they have lifted the Kings of the Sevens title - won after 10 gruelling tournaments - and he is certainly one to watch on the sevens field. “Last year’s win at the Melrose Sevens was just amazing for us, even thinking back on it now brings a big smile to my face,” McKean told TRU. “In recent years we have had a good sevens squad at the club, but had never managed to win at Melrose and it was something we were determined to try and do. “I think in any sevens tournaments you just have to focus on one tie at a time and certainly at Melrose 12 months ago, we had to do that because all of the matches were very close. “We edged out Selkirk first up [24-19] and then beat select side the Crusaders [21-5] and that put us into the semi-finals. “The guys were feeling quite good at that stage, but we knew that Marr had been going well and they were a physical seven with a couple of guys with a lot of pace. “We went behind early on in that one, but I think in those kind of situations, it is where experienced players such as [ex-Scotland Sevens cap] Andrew Skeen come into their own. “He knows the game inside out and never panics, that is key in sevens. Often players try and force a pass that isn’t there or think that there is not enough time left on the clock, but players like ‘Skeena’ just stay calm and that helps those around him. “We battled through that game in the end to win 19-14 and we knew then that we would be playing Melrose in the final. “Over the years we have had a lot of tussles with them on the Kings of the Sevens circuit, but to play them on their home patch with 99 percent of the crowd cheering them on was just something else. “It was a really fast game which went from end to end, but I just remember the moment when Charlie McKill gained a crucial turnover and then went down the other end and scored, it was massive for us. McKean’s grandfather Donald Scott, a proud Borderer who represented Langholm and Watsonians with distinction and earned full Scotland XV-a-side-caps in the early 1950s, was not there in person to see his grandson lift the trophy, but was keeping close tabs on the tournament. McKean explained: “The next day we had a 90th birthday party for him so it was great that we were all able to talk about the Melrose Sevens win, it certainly made him feel proud which was a nice birthday present the family thought! “Looking ahead to this weekend, well the squad are all looking forward to heading back to Melrose, but we know it will be tough to retain the trophy with a strong looking field and the likes of London Scottish coming up for it. “However, we reached the final of the Gala Sevens last weekend [won by Edinburgh Accies] and we have had five or six guys coming back from playing for invitational teams at the Hong Kong 10s so training has been good this week and competition for places in the squad is fierce. “We will do what we always do, concentrate on the first tie and then build from there - the Melrose Sevens is certainly a special day in the calendar."